The Zero has been undercoated and has the undersides painted (first coat) this will be real world, but I've another to wif If I can think of anything to do it as ? Zero has had her top coat painted (3 coats - bloody Tamiya acrylics - why do they missbehave sometimes ?). Been Futured, and has the first of the transfers on. Tempest II has her top colours done and transfers on. Needs all the fiddly bits adding now. Me 110 - (real world build) I'm begining to feel sorry for this kit. I'm not happy with it (nothing to do with the basic kit, it's just been one of "those kits" for me) and it knows it. Not to far off finishing but she will go straight into long term storage. I've got the tropicalised verion of the kit as well, hopefully I can do a better job on that. Beaufighter and Mosquito. No progress as I want to get my work bench clear and cleaned before I get on more with them. Still not decided on the Mossie if she will be real or wif ? Looking forward to the Zero, as I now have one in the stash (why would you want to shell out a shed load on a Tamiya Zero, by the way?). Ideas for your second Zero? Whiffery, sir! Subject? The Zero to me has many design traits reminiscent of Italian fighters of WW2. Alternatively, graft a BMW801 on the front and have it as a license-built machine for the German Navy. It is a really nice kit Dave, goes together like a dream. I'm impressed with the engineering of it I may still get a new Tamiya one however just to see what they put into it. As for the second one it will probably get finished in the all over "grey" scheme - I've the right White Ensign paints. A third one is likely to be purchased and may end up as post war French ? Indonesian ? Thai ? Decided to wait to do photographs until the Tempest and Zero are completed in the next few days. Thai I think, mon brave. Not unfeasible given that country's role in South East Asia during WW2. So the Tempest II and Zero are nearly complete, just those dozens of little jobs that seem to crop up at the end of a build. Photo's latter this week. The Me 110 has it's final bits and bobs on just need matting down and then finishing. Started on an Airfix P-40B which will be real world and I'll build this at the same time as the more complicated Beaufighter and Mosquito builds. As long as the line doesn't blur between "Dog Food" and "Dog? FOOD!" it's okay Narses2. Right Zero and Tempest II are finished - photo's latter this week. Me 110 has its first matt coat. The P-40 is all assembled and is awaiting the Mr Surfacer drying then it can be cleaned up. 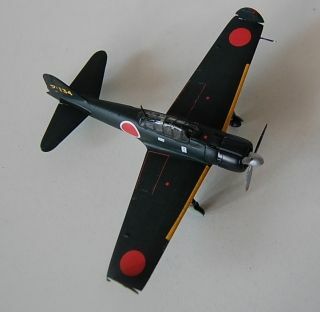 It's another nice kit (I'm falling in love with Airfix again ) that has a couple of extra seams where they have made provision for latter variants and in all honesty a better modeller then me probably wouldn't have needed any filler. If I have one criticism it's that all the sticky out parts are moulded in situ - guns, aerial etc - and are just begging to be snapped off. Will be real world, 112 Sqd as I havn't got one in the collection. Started painting some parts of the Dauntless. The Zero was also finished but as it's real world I'll just stick 2 photos here. As I said this is a great little kit and I'm already building another one. The P-40 has had it's undersurface Azure blue painted and hopefully will get finished next week. Won't be much progress for a few days now but hopefully next week. 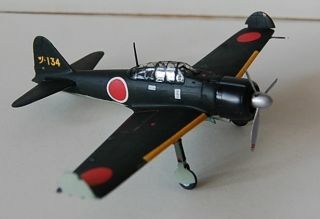 Excellent A6m ! Be it a Whiff or wanna-be.